This skirt is a variation of the Putting on the Pleats skirt (available at http://www.ravelry.com/patterns/library/putting-on-the-pleats) and Take-Two Skirt (available at http://www.ravelry.com/patterns/library/take-two-skirt). For this version, I used Halcyon Victorian 2-Ply Wool at 6 stitches/inch and decorated each “pleat” with a zigzag of traveling stitches. Designed to have about 2″ to 3″ (5 to 7.5 cm) negative e3ase around the waist and high hips, this skirt stretches as necessary for a slimming fit. Four darts shape the taper from the waist to upper hip circumference, then purl stitches are added in “gores” between mostly stockinette stitch “pleats.” Twisted knit stitches on both sides of each pleat sharpen the boundaries between pleats and gores. A simple bind-off produces slight scallops around the lower edge. Choose a size that’s 2″ to 3″ (5 to 7.5 cm) less than your actual high-hip measurement–about 3″ to 3 1/2″ (7.5 to 9 cm) below the bottom of the waistband. The waist circumference can be fine tuned by adjusting the circumference of the elastic added to th4e waistband during finishing. The skirt has eighteen “pleat” panels, each consisting of 12 (13, 14, 15, 16, 17) stitches. Purled gore stitches are added between these panels; the flare at the lower edge is created by progressively increasing the number of stitches in each gore. The skirt length can be adjusted by working more or fewer inches after the last pleat increase round. 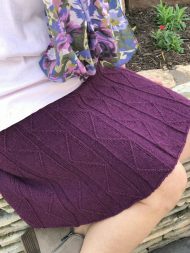 You may need more yarn if make a longer skirt.